Silver fillings have offered reliable durability, but at a price. For one, silver fillings can tarnish and appear black over time. They can cause teeth to appear more grey in color and that is not pleasing to most people. While they restore teeth and make daily functions easier, they can cause aesthetic concerns in some locations. Compare that to tooth-colored fillings which can be shaded multiple colors in order to better match your existing teeth. 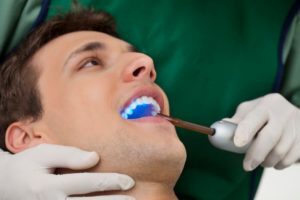 By the time they are packed inside your damaged tooth, properly shaped and molded, and finally hardened with a curing light, you won’t remember where the filling was placed. You can smile all you want without worry of anyone noticing your restorations. When you have a cavity the damaged tooth structure needs to be removed. Because silver fillings require a certain amount of thickness and filling design for strength, a greater amount of tooth may be need to be removed. While this may sound counter-productive, it’s necessary for making sure that the filling stays secure for several years. Alternatively, composite resin is bonded to the tooth structure when placing dental fillings. Therefore, it’s far more likely that the dentist will not have to remove as much tooth structure just to make sure the filling stays secure. Cochell Family Dentistry uses tooth-colored fillings to repair teeth in just one appointment. To learn more about their practice or restorative treatments, you can contact the dentists through their website.